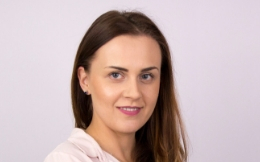 Natalia Ciosek, co-founder and shareholder of Runvido and a second app – image4you. Graduated from English Philology (at WSF, Wroclaw), Journalism and Social Communication at University of Wroclaw. Working in printing industry for 12 years and 9 years in a printing house; being on managing positions for 9 years all together. Communicates in 3 languages (Polish, English, Spanish). In Runvido works as a Managing Director, presents the company in front of investors and customers. With her colleagues won many prizes for Runvido, including “We can start-up” in Berlin (1st place in female start-up competition), Best Start-up Presentation during Central European Startup Days in London, took part in Start Alliance program in Berlin, V4 Start-up Force in Hungary, Czech Republic, Slovakia and Poland (3-weeks-long program), selected as a Wild Card to Innovation Station’19 in Portugal.